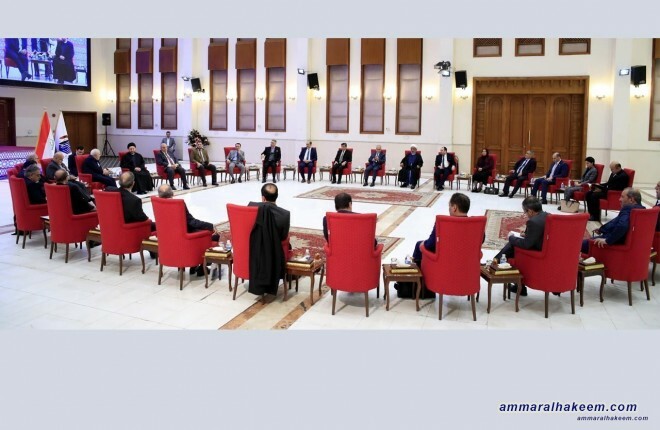 His eminence called on the countries of the region to stand on a positive neutrality and understand the nature of the political alliances in Iraq that are unbiased to sectarian and ethnic titles and are rather national titles, pointed out that the Reform and Reconstruction Alliance represented by diversity and the Al-Bina Alliance with its variable diversity, is an important and positive variable and a founder of future alliances forming the wings of the political process the pro-goverment and opposition. His eminence confirmed that the relationship between Iran and Iraq is a strategic relationship, and that the Iraq supports Iran in relation to the sanctions and the embargo imposed on them, and considered the unilateral sanctions a serious precedent in international relations and compliance with international law and international contexts, for that his eminence called for greater relations based on common interests in economy level, economic relations and the fight against terrorism. His eminence indicated that Iraq is witnessing a new phase after concluding the elections and formed a new government, and added that US withdrawal from Syria and the return of the Arab embassies to Damascus are positive signs, called for completing the political and peaceful solution in Syria and in Yemen. Dr. Zarif praised the political role played by Sayyid Ammar al-Hakim and the Reform and Reconstruction Alliance, described his eminence policy wise, and stressed that consolidation of Iraq democracy is admired by the Republic, revealing a close visit of President of the Islamic Republic of Iran Sheikh Rowhani to Iraq, congratulating Iraq, the Iraqi people, political leaders and religious authority for the achieved victories.